Some parents and adults are hesitant to turn to medication. There are several things to try before trying medication if you are one of these parents or adults. However, even after medication, the following suggestions may still help. Change where a child sits in the classroom to a place closer to the board or teacher’s desk, away from distractions such as the window and door, or closer to a student who can model on-target behavior and serve as a “study-buddy” for the ADHD child. Change the school routine, by changing the way assignments are given, adding breaks and specific positive feedback (“You did a really good job finishing all the problems on the page this time”). Simplify instructions to a step-by-step process; for example, “First circle all the nouns and then come back when you’ve finished” followed by “Good work! You got all the nouns. Now underline all the verbs and come back when you have finished…”). Reduce written work requirements when possible, but when not possible focus the child with things like circling key words in the instructions to remember and make the child repeat instructions to assure comprehension. Change classrooms or schools, which can lead to changes in classroom size, teacher-student one-to-one attention, and peer and teacher interactions. Use guided praise: When a child does part of the task right, immediately reinforce that behavior, to keep them at it. Add “do” statements to your feedback like, “Always remember to look behind the chair for dirty clothes” instead of “Didn’t you look behind the chair? I can see clothes on the floor back there. Pay attention!” Be specific about what is good, and focus on it instead of criticizing shortcomings. You have to remember to “pick your battles” though; who cares which drawer the clean shirts and socks are in, as long as they are in the dresser. Take other activities like going to the grocery store. Pick three rules for the trip, like “Rule 1: Stay with dad, don’t run off. Rule 2: Ask before touching anything. Rule 3: No nagging for food.” Barkley recommends taking a $2 roll of nickels and rewarding the child at the end of every aisle in the store if they behaved. Repeat the rules, point out how they adhered to them, and give them a nickel or two. At the end of the trip, the child can buy a pop or candy bar with their “earnings.” Some parents call this bribery, while others offer that avoiding the headache and hassle by paying $2 is worth it. Ignore acting out/attention seeking behaviors, like temper tantrums. Use time outs effectively, targeting specific behaviors for correction and “let the rest go” until the target behavior problems are under control. A corner of the frozen food aisle in the grocery store, or a quick trip to the car for 10 minutes to remove the child from the environment can be helpful. Maintain teacher-parent feedback, and tie home rewards and consequences to home and school behaviors. You can make this easy for the teacher by sending a set of forms to him or her with a space for the date, your child’s name already printed on it, and a safety pin to pin it to their jacket. Include your home or work number and the best time to call if possible. Rental privileges: Instead of going bankrupt buying things your child wants, buy them something they want and “rent” it to them. Good grades this week means free access to their bike next week, for example, but bad grades means losing the bike next week. Changing reinforcers. Barkley argues that ADHD children become bored more quickly, and so be prepared to change reinforcers as the ones you pick and find work won’t work forever. They are more effective when they are short-term ones that will soon be awarded. Promising a desired toy in exchange for one month of good behavior is like playing the lottery, Ingersoll says, in that the ADHD child has the same chances of winning one as the other. Don’t reinforce in advance. Ingersoll gives for example allowing TV privileges in advance for chores done later. The ADHD child promises, and does intend to do it, but forgets, gets distracted, starts but doesn’t finish… creating more problems than before. Maintain organizational routines and schedules. Checklists, homework sheets, colorful reminders of routines, etc… can be very helpful in organizing a child. Don’t over-schedule a child’s week though, and keep things simple as much as possible. Simple furniture, simple routines, and simple chores make for an easier time at home. Tougher classes earlier in the day can also be helpful when their medication is at its peak. Sometimes, completing high school in four years with five days a week of seven classes is too much. A five year plan, with a lighter class load, might be more effective, especially if failing a grade is likely otherwise. Work with the school to build your child’s or teen’s schedule carefully, and make friends with your child’s teacher and principle. Recognize your child’s limits. Don’t compare them to other kids and find them coming up short all the time, but do think ahead to situations that are likely to be problematic and see if you can think of ways to minimize these problems. Accept what he or she can’t do for now and move on. Boost self-esteem. Praise and encouragement, coupled with peer acceptance go a long way. Positive social outlets, chances for exercise and “hyper activities” like outdoor games and time at the park may be very helpful. Ingersoll discusses other problems such as bed-wetting, lying and stealing, and social problems in detail in one chapter, and has another chapter devoted to helping teachers and parents who home-school their ADHD child. It may keep children more focused on their work, increasing their responsiveness to praise and positive reinforcement. They may complete more work and give more accurate answers. This could improve their grades, help teachers see their efforts are paying off, and give the child some sense of success. It may make ADHD children look more like their peers in the classroom and in social settings, decreasing their impulsivity, aggression, frustration, and behavior problems. This can lead to increased social support and make sports, playground interactions, and birthday parties a lot easier for the child and make them feel better about themselves. It may decrease the negative impact of attention problems and learning disabilities, and allow them to “pick up” on more in class, in one-on-one peer interactions, and in child-adult interactions. This may make the child less frustrating to babysitters, neighbors, and teachers as they do a better job of following rules. It does not improve long-term scores on achievement tests. In other words, the gains in classrooms may be real, but may not show up on standardized tests. This may make standardized training programs and other kinds of classes more difficult than you might have expected. It does not teach skills the children missed in the past or magically “fill in the gaps” in their learning, social skills, and relationship skills. They may still have trouble handing frustration, making themselves study, or “playing nicely” with other children. Medication does not teach reflective thinking and better problem solving skills, teach a child how and where to direct their attention, or increase the ADHD person’s motivation to learn and work. Medication also will not erase or minimize a true Learning Disability. The child may still have trouble sounding out words and understanding paragraphs and homework assignments. It does not produce the same level of improvement in all cognitive areas. The child may perform better in the classroom in some classes, but not in others. For example, a “hands on” science teacher may find the child has more ability to focus on the demonstrations in class and understand their point, but a reading teacher may still see poor ability to follow along in class when another student reads. It does not make a child “happy.” If your child feels stupid, disliked by peers, and as if “something is wrong with me,” medication will not make this go away. Some children may see the medication as “proof” that something “bad” is wrong with them. Keep in mind that when Ritalin doesn’t work, another drug in the same class still might. Likewise, just because a child at age six years does not show apparent benefits from Ritalin does not mean they never will. Trying the drug again in two years might produce results. There are also numerous other drugs that doctors may prescribe that have different mechanisms of action but may still attack the same underlying problems. Sudderth and Kandel discuss antidepressant medications (tricyclic, MAO inhibitors, and SSRI medications), dopamine agonists, antihypertensive medications, anticonvulsants, and even combinations of medications. Garber, Garber, and Spizman discuss across several chapters the ways that the parent can compensate for the problems medication will not address, including guiding principles to keep in mind to aid in academic and social development. They also discuss Self-Monitoring Skills, relaxation training, and use of imagery, and give good details to aid in learning/teaching these skills. They discuss the data on other options, like control of diet, limited intake of sugar, and vitamin and amino acid treatments. Ingersoll also discusses something I have seen in few books about ADHD. 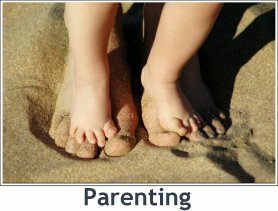 She discusses the impact of the child’s behavior on the parents as a couple. Both are likely to feel like failures to each other and society, but family pressures to do things differently, become more or less strict, use more or less discipline… can be stressful. Some parents blame each other (e.g., “He doesn’t act that way with me. What are you doing wrong?”). Children do behavior differently with different adults, and males may have fewer discipline problems as they may tolerate less acting out and respond sooner to problems, and their greater size may intimidate some children. Likewise, sometimes stressed parents have less attention and sometimes less patience for the non-ADHD siblings, leading to resentments (e.g., “You knew that would start a fight with your brother so why didn’t you just let him have it?”), guilt (e.g., “After wrestling with Tommy, I just am too tired to do anything with his sister. I’m a horrible mother”), and more anger (e.g., “He gets all the attention and I get nothing!”). The drain of raising an ADHD child can take its toll on marital intimacy, time alone for the couple, and pleasant interactions as a family can be significant. Ingersoll includes a chapter on this as well as ways for the parent to cope more effectively on a personal level, as well as help siblings get along with their ADHD brother or sister. Conduct problems are seen in 5-10% of children and adolescents, and make up over 50% of reasons for referral to mental health clinics. Children with both have more severe conduct problems, covering a wider range of areas, and starting earlier in life. Teachers and parents rate their behavior problems as more severe, but not their inattention and impulsivity, and they have lower Verbal IQ scores. Children with both also have more peer difficulties. Impulsivity seems to be the key, as ADHD inattentive type children were less likely to later have conduct problems. Problems seem to begin with hyperactive behaviors first, less severe conduct problems, then more severe conduct problems. Children with both problems receive more negative parenting (but not harsher discipline). Children with hyperactivity and conduct problems, or just conduct problems, tend to come from lower SES backgrounds. For more information, see A Meta-Analytic Examination of Comorbid Hyperactivity-Impulsive Attention Problems and Conduct Problems 2002, by Waschbusch, published in Psychological Bulletin, volume 128, issue 1, pages 118-150.